Congratulations are in order to the Space & Missile Center. The U.S.A.F. facility has accomplished two crucial missions  the first is the fully operational status of the final Global Positioning System IIR satellite and the second is the National Geospatial Agencys (NGA) certification and acceptance of the Space Based Infrared Systems, Highly Elliptical Orbit data for use in support of technical intelligence missions. General C. Robert Bob Kehler is Commander, Air Force Space Command, Peterson Air Force Base, in Colorado. He is responsible for organizing, equipping, training, and maintaining mission-ready space, cyberspace, and missile forces and capabilities for North American Aerospace Defense Command, U.S. Strategic Command, and other combatant commands around the world. General Kehler oversees Air Force network operations; manages a global network of satellite command and control, communications, missile warning and launch facilities; ensures the combat readiness of Americas intercontinental ballistic missile force; and is responsible for space system development and acquisition. He leads more than 43,000 professionals, assigned to 86 locations wordwide and deployed to an additional 35 global locations. Major General Craig P. Weston recently retired from active services with the United States Air Force on June 1, 2005 having experienced years of command service in which he was the U.S. Security Sector Coordinator and Chief, Office of Military Cooperation  Afghanistan, U.S. Central Command, in Kabul, Afghanistan. A graduate of the U.S. Air Force Academy in 1972 General Weston has been a flight test engineer, engaged with satellite operations, commanded a major program office, managed a portfolio of major acquisition programs and guided the daily activities of a large acquisition center. Craig Cooning, Vice President and General Manager, Boeing Space and Intelligence Systems, is responsible for the leadership of the people, programs, and assets of the companys military, civil and commercial satellite systems, as well as the Spectrolab subsidiary. Prior to joining Boeing in September 2005, Cooning, a retired Major General from the United States Air Force, was Director of Space Acquisition in the Office of the Under Secretary of the Air Force. He provided acquisition support to the Under Secretary and program management direction to field organizations for the development and procurement of Air Force surveillance, communications, navigation and weather satellites, space launch systems, information warfare capabilities, ground-based strategic radars, communications and command centers and sustainment for the nations land-based strategic nuclear missile systems. Joan Grewe is the Vice President of Corporate Business Development at Integral Systems and she is a recognized subject matter expert in assessing U.S. telecommunication vulnerabilities. Most recently, prior to joining ISI, Ms. Grewe was TerreStar Networks Director, Department of Homeland Security (DHS) Services, responsible for business development within the DHS and DoD communications security arena. While with TerreStar, Ms. Grewe chaired the DHS-sponsored Communications Sector Coordinating Council. Peter Shaper has been the CEO of CapRock Communications since its acquisition from McLeod in 2002. Mr. Shaper is also a founding partner of Houston-based private equity group Genesis Park. Previously, Mr. Shaper was the president of Donnelley Marketing, a division of First Data Corporation. He was directly responsible for the turnaround and eventual sale of the $100 million revenue database marketing company to a strategic buyer. In 1996, Mr. Shaper helped found the Information Management Group (IMG) as its Executive Vice President of Operations and CFO. IMG grew to more than $600 million in revenue during his tenure. Prior to joining IMG, Mr. Shaper was with a Dallas-based private equity firm where he was responsible for investments in numerous technology oriented companies, as well as assisting those companies with developing long-term strategies and financial structures. Mr. Shaper also has several years of experience with the international consulting firm McKinsey & Company. One of the most widely appreciated analysis firms with a 20-year track record is Futron. The Company provides premier Decision Management Solutions and products to a variety of complex technology industries. Futron offers architectures and solutions that transform data into valuable intelligence for informed decisions, to substantially improve judgments in business, program, and project management and engineering. We thank Futron for allowing us to reprint one of the most critical segments of their recently published 2009 Space Competitiveness Index (SCI)  Global Military Space. Again, this is but one single index within their exhaustive report. 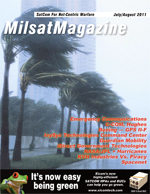 ON TARGET: Cisco Skips into the Military Satellite Market, by Nick Yuran, VP, Business Development, Global Protocols, Inc.
Leave it to Cisco to enter a new market segment and instantly become a market leader. Although not a traditional market for Cisco, thats precisely what they have managed to do with their recent entrance into the military satellite acceleration arena. With the addition of Global Protocols SkipWare® software to Ciscos WAAS WAN optimization technology and router line, this combined product is making immediate inroads into the military SATCOM market and popping up in networks throughout the U.S. DoD. For any public safety agency, the ability to ensure communications continue to operate in the face of emergencies or natural disasters is critical. On-scene personnel must have constant access to voice and data, even when local network services are down. The Missouri Department of Transportation (MoDOT) has experienced first-hand the importance of a reliable emergency communications network. In 2008 alone, Missouri dealt with disastrous situations including major flooding and ice storms that were declared state emergency situations. By providing emergency communications services during situations like these, MoDOT helps save lives. If youre unfamiliar with communications analysis, 3 dB (short for decibels) is probably meaningless. Those designing and relying upon communication systems, however, understand that 3 dB is a factor of two that, in terms of communications performance, can mean the difference between mission success and failure. A major challenge for the U.S. military is providing reliable voice and data links to small units of warfighters operating in remote, hostile corners of the globe. In Afghanistan, land-based wireless infrastructure is lacking, and mountains and harsh weather conditions often disrupt radio and satellite transmissions to troops at the edge of existing military networks. Within the space industry, there is a growing concern over how safe operations are in space. The Iridium incident this past February illustrates the fact that satellites are at risk of an accidental collision. Even though very little can be done about the number of objects already in space, the risks of future collisions can be reduced by a more precise and timely cataloging of these objects. Improving Space Situational Awareness (SSA) is an increasing priority across the space community. Owners and operators are investing in mechanisms to share their spacecraft positional data with each other while countries around the world are increasing their capabilities to find and track the objects in space. With the publication of the Presidents Cyberspace Policy Review: Assuring a Trusted and Resilient Information and Communications Infrastructure on May 29, 2009, the interdependency of public and private information infrastructures and the fragile security state of these infrastructures were highlighted. Satellite Communications are a key element of several National Critical Infrastructures. The Federal Information Security Management Act of 2002 (FISMA), consists of Title III of the E-Government Act of 2002 (U.S. Public Law 107-347) which was enacted into law at the close of 2002. FISMA provides an assessment framework for the protection of government information assets against various threats. By assessing the criticality of the information transmitted, and determining the protection capability of the providers infrastructure, an educated risk acceptance decision can be made. Grand plans such as the Department of Defense move to a more unified and effective Global Information Grid (GIG) of military networks often run headlong into reality. The DOD played a key role in the creation of the Internet Protocol, so it certainly makes sense that the U.S. military should maximize the advantages of todays commercially available and increasingly sophisticated IP technologies. In an everything over IP (EOIP) environment, the communications needs of a mission can be met with a fraction of the equipment and support personnel required to deploy separate data, phone, and video conferencing networks. EOIP communications systems result in higher mission effectiveness with lower implementation costs.